Experiencing the stadium sound in your own living room as if you were present at the football match is just one feature of the new MPEG-H Audio technology. Specifically developed for next generation television and streaming systems, the audio codec is now part of the Korean standard for terrestrial Ultra High Definition TV recently published by South Korean standards organization Telecommunications Technology Association (TTA). If governmental officials approve the standard in September, MPEG-H Audio will provide a completely new sound experience in the world’s first 4K TV system, which will launch in South Korea in February 2017. The inclusion of MPEG-H Audio in the TTA UHD TV standard makes it the first next generation audio codec to go on air in a terrestrial 4K TV system. The codec was primarily developed by Fraunhofer IIS. It enables immersive and interactive sound, providing consumers the ability to adjust the sound mix to their preferences e.g. choosing between different commentators in a sporting event. Additionally, the codec delivers a truly immersive experience by adding 3D audio components. Thanks to these new features, TV audiences have the ability to watch movies with 3D sound and can experience sporting events or concerts as if they were present at the venue. MPEG-H is already being integrated into TV sets and professional equipment in advance of the launch of Korean terrestrial UHD TV system. Most recently, the broadcast equipment manufacturers DS Broadcast and Kai Media announced the availability of MPEG-H Audio in their latest 4K encoder products. More product announcements are expected for this fall. MPEG-H Audio is part of the A/342 audio candidate standard (http://www.tvtechnology.com/news/0002/atsc-a32-audio-elevated-to-candidate-standard/278594) for ATSC 3.0. The Korean TTA standard “Transmission and Reception for Terrestrial UHD TV Broadcasting Service” (http://www.tta.or.kr/English/new/standardization/eng_ttastddesc.jsp?stdno=TTAK.KO-07.0127) is based on ATSC 3.0 and specifies MPEG-H Audio as the sole audio codec for the Korean system. According to Korean government representatives, the Seoul metropolitan area will be the first to receive the UHD TV service. After Seoul, it will expand into cities near the venues of the 2018 Winter Olympic Games in Pyeongchang. By 2021, the service will be available nationwide. At KOBA show in Korea, MPEG-H Audio was presented in a 4K live broadasting chain with equipment provided by ETRI, Kai Media and DS Broadcast. The MPEG-H Audio codec is ready to use in a broadcast system, as demonstrated by Fraunhofer IIS in a series of events. 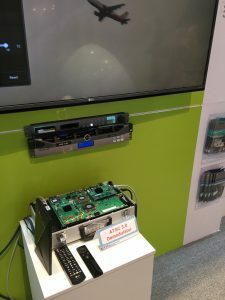 The most recent demonstration took place at KOBA Show in Seoul in May 2016 where Fraunhofer IIS presented a complete ATSC 3.0 broadcast chain with MPEG-H Audio. In workshops during and after the show, broadcasters and interested attendees were able to learn more about the opportunities the new codec can provide to broadcasters, as well as consumers. Further information about MPEG-H Audio is available on the Fraunhofer web page and on www.mpeghaa.com.